Created by author Jack Boyle, Boston Blackie was a master safecracker and hardened criminal who served time in a California prison. Rehabilitated, he decided to use his knowledge of the underworld to fight crime as an amateur detective. Known as "an enemy to those who make him an enemy, friend to those who have no friend," Boston Blackie's exploits were adapted to film, radio, and television. While investigating cases, Blackie would invariably encounter harebrained Police Inspector Faraday and always solve the crime before Faraday could. The initial friction between Blackie and Faraday gave way as the series continued and Faraday came to recognize Blackie's talents, occasionally even requesting his assistance. Blackie dated Mary Wesley, and for the first half of the series, his best pal Shorty was on hand. 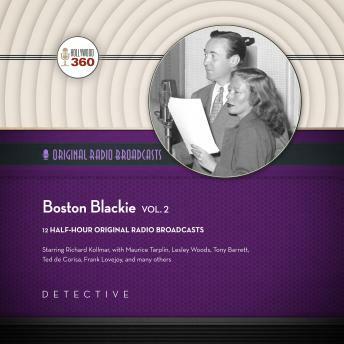 "The Search for Jim Gary"
"Jacques Pierre and the Diamonds"
"Seven Years' Bad Luck for Florence Wells"
"Larry 'The Kid' vs. Savinni"
"The Tenth Street Gym and the Stolen Car Ring"
"The Horseroom Thefts of Boston Blackie"